Save a piggy! 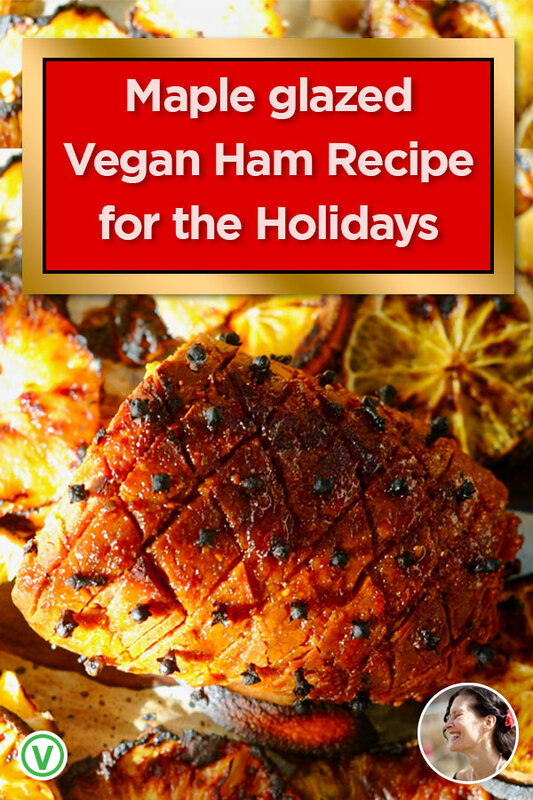 Make this clove studded, maple glazed, vegan seitan ham roast this Holiday! If you are looking for a centerpiece for your vegan holiday table this is it folks. 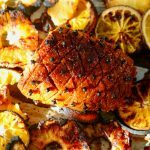 Place this Vegan Ham roast on your favorite platter decorated with charred pineapple and orange slices and studded with cloves. It looks stunning. It smells amazing and it tastes Divine. 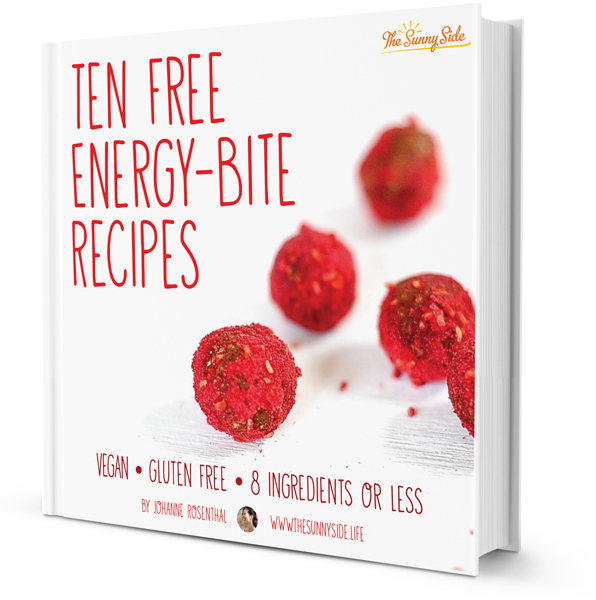 Take a moment to watch it glow in the candlelight and then dive right in! 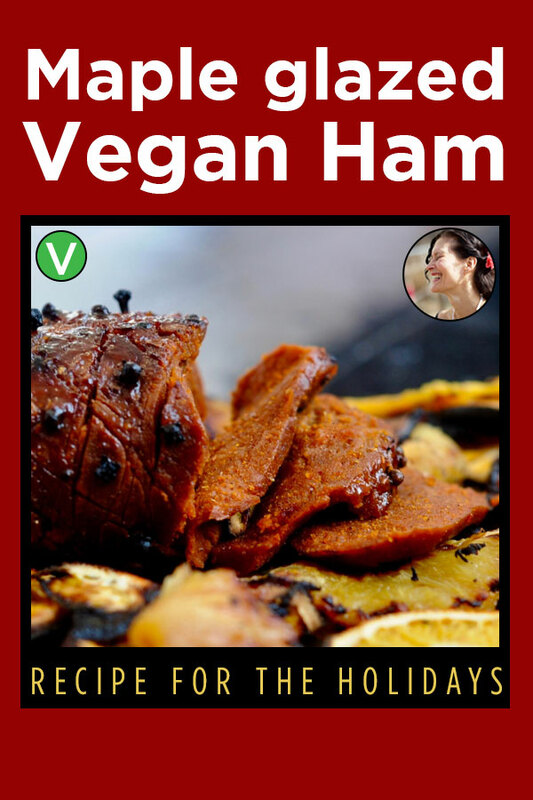 Each slice of this Vegan Ham Roast is salty, sweet, smoky, toothsome and tangy. Have you ever cuddled a piglet? Imagine a squirming velvet bundle with pale pink skin, translucent sea shell ears and limpid trusting eyes that lock on yours like a human infant’s. This little piglet gazes into your eyes and as you croon non-sense lullabies her body relaxes, her eyes blink slowly closed and her snuffling snout puffs warm air onto your cheeks. And she sleeps trustingly in your arms. When wakes she’ll wriggle free to play with her siblings or nurse her Mama’s thick rich milk. For me it broke my heart and healed it in one sun splashed afternoon. 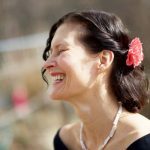 My dear friend Alison took us to visit the Woodstock Animal Sanctuary a couple of years ago. Her dear, delightful, incomparably beautiful sister Nancy hosted us at her traditional Bed and Breakfast that is near to the sanctuary and fed us some of the best Vegan food around. 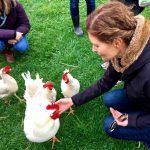 When you sit at the table on Easter and your relatives and friends poke and prod you about why you are Vegan tell them the story of Sweet “Unsinkable” Molly Brown, who now lives at the Iowa Farm Sanctuary. 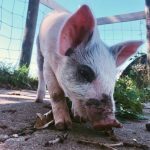 At just 21 days old, Molly was loaded onto a massive semi trailer with hundreds of other piglets and taken to a facility to be fattened up for slaughter. While the other piglets were pushed off the truck at the facility, Molly hid and went unnoticed. . While flooding the truck whith water to clean it, Molly floated out and was discovered, nearly drowned, and saved by an employee. 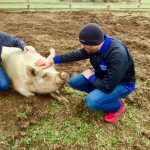 You can check on Molly’s progress on the Iowa Farm Sanctuary FB page, watch videos of the jokester Molly had become and donate to their worthy cause this Easter in the name of the voiceless piggies that aren’t rescued in time. 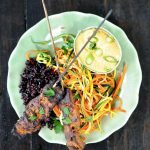 Seitan Satay with Spicy Peanut dipping sauce is an easy beginner seitan recipe. 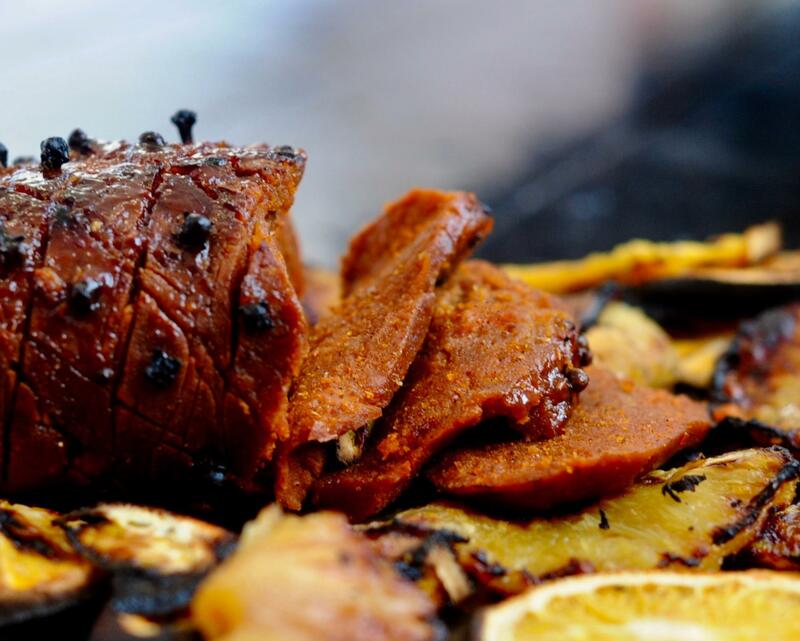 A reader last week commented that I could use my Smokey Seitan Bacon as a ham recipe. I agree! And here it is. A make ahead Vegan seitan ham roast that makes for the perfect centerpiece on the plant based table. 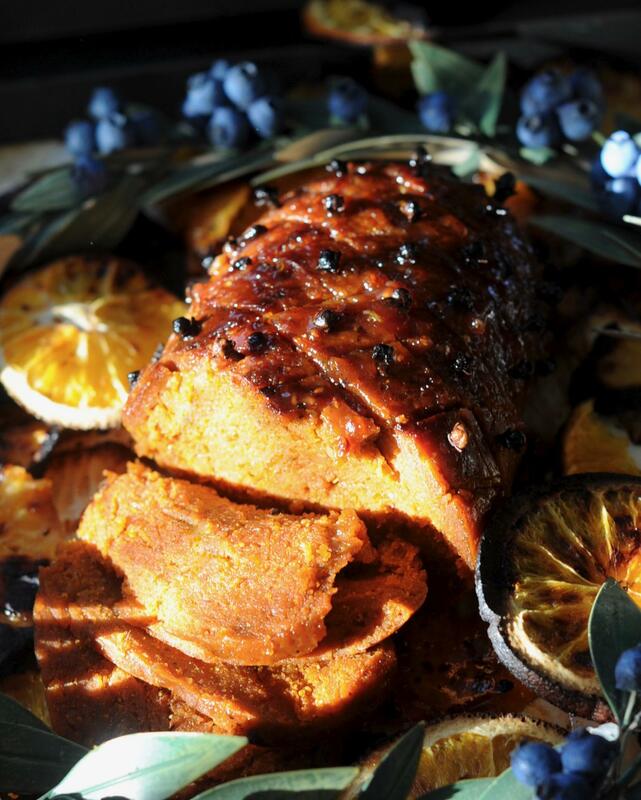 Brushed with a smokey maple syrup glaze and studded with cloves it is beautiful, delicious and cruelty free! 1/4 tsp ground cloves important! Mix up all the ingredients to your glaze and set aside. It will be strongly flavored. Play with the balance of flavors to your own taste. In a large bowl stir together the dry ingredients (the first 7 ingredients) until combined. In another bowl stir together all the the wet ingredients (tahini trough vegetable broth) until smooth. Pour the wet into the dry and stir until a dough forms. I like to do my kneading in the stand mixer with a dough hook but you can knead it by hand as well. If you re using the stand mixer the place the dough in the stand mixer and allow it to knead with the dough hook for 6 minutes on medium speed. I think the texture is much better when I use the stand mixer. It makes for a denser loaf. If you are kneading by hand then you will need to knead for 10 minutes until the dough is super dense and rubbery. Here is how I got my ham shaped vegan ham. I rolled my seitan dough into a ball and placed it on a square of plastic wrap. I then enclosed it and pulled the plastic tight around it until it was a smooth roast like soap. 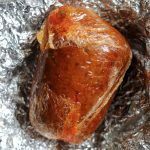 I then removed it from the plastic, brushed it with 1 tablespoon of the marinade and wrapped it tightly in aluminum flow. The dough will try to expand during baking and I find the more I constrict its "rise" the denser and toothsome the final texture. Bake for 50 minutes at 350, turning every 15 minutes to ensure even baking. Remove from oven and allow to cool completely. You can store it at this point wrapped in the refrigerator for up to 5 days. Once completely cool, score the outside of your Vegan ham into a diamond pattern with a sharp knife and insert a clove into the center of each diamond. See photo. 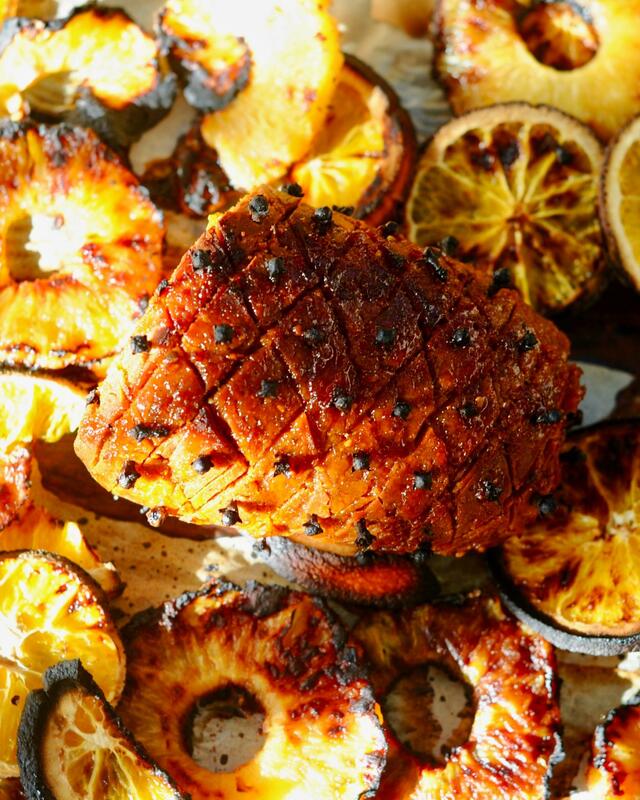 Place the roast on a baking pan and surround with sliced pineapples and oranges. Brush with glaze. Bake 15 minutes at 375 Fahrenheit brushing with glaze as often as possible until fully heated. If you desire a brown exterior the place under the broiler on high for 4-5 minutes. Serve with any extra glaze. Oh wow, that is one show-stopping grand entree to top them all! The crosshatching is on point and the flavors sound brilliant. I want to host a big party now just to have an excuse to try this recipe out. Now that would be quite the party! I volunteer to do the dishes. ” ‘How’s this?’ he asked, showing the ad to Charlotte. Ahhh Helle you really get the gist of this. BH was very like Charlotte, no? When I read it aloud to the kids I used her voice.